Chemtrails or Contrails: Conspiracy or Simple Science? The conspiracy theory is that government officials are conducting experiments in atmospheric science, and some of them involve a highly classified military project which involves protecting us from some as yet unknown threat. The theory is that some contrails are actually chemicals or biological agents deliberately sprayed at high altitudes for a purpose undisclosed to the general public. The side effects of people getting sick is part of the price we pay for defense is what the some people think. 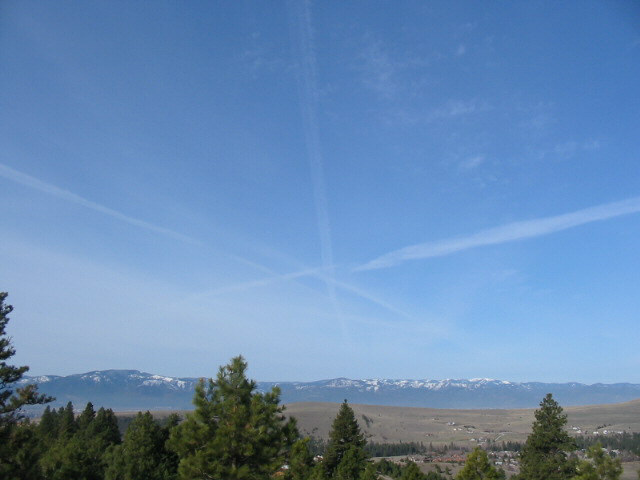 People worldwide are reporting what they describe to be unusual activity in the sky, including jets leaving trails at low altitudes, spray lines creating X's, S's and parallel lines, lines that slowly spread to create a canopy of haze, and reports of unusual smells, tastes, and even illness related to the trails. This conspiracy theory has been sweeping the Internet and radio talk shows has set parts of the federal government on edge. The US Government has received thousands of phone calls, e-mails and letters in recent years from people demanding to know what's being sprayed and why. A hoax that has been around since 1996 accuses the Air Force of being involved in spraying the US population with mysterious substances and show various Air Force aircraft "releasing sprays" or generating unusual contrail patterns. Several authors cite an Air University research paper titled "Weather as a Force Multiplier: Owning the Weather in 2025" (http://www.au.af.mil/au/database/research/ay1996/acsc/96-025ag.htm) that suggests the Air Force is conducting weather modification experiments. The purpose of that paper was part of a thesis to outline a strategy for the use of a future weather modification system to achieve military objectives and it does not reflect current military policy, practice, or capability. The Air Force's policy is to observe and forecast the weather. The Air Force is focused on observing and forecasting the weather so the information can be used to support military operations. The Air Force is not conducting any weather modification experiments or programs and has no plans to do so in the future. The "Chemtrail" hoax has been investigated and refuted by many established and accredited universities, scientific organizations, and major media publications. Claim: Long-lasting contrails are something new and they have abnormal characteristics. Fact: Contrails can remain visible for very long periods of time with the lifetime a function of the temperature, humidity, winds, and aircraft exhaust characteristics. Contrails can form many shapes as they are dispersed by horizontal and vertical wind shear. Sunlight refracted or reflected from contrails can produce vibrant and eye-catching colors and patterns. Observation and scientific analysis of contrails and their duration date back to at least 1953. Claim: Grid patterns of contrails in the sky are evidence of a systematic spraying operation. Fact: The National Airspace System of the United States is orientated in an east-west and north-south grid with aircraft flying at designated 2000 foot increments of elevation. Contrails formed by aircraft may appear to form a grid as the winds disperse the contrails. More contrails are seen in recent years due to the growth in the civil aviation market. The FAA is responsible for the NAS and Air Force aircraft operate under the same rules and procedures as civilian aircraft when using the NAS. Claim: There are reported outbreaks of illness after the appearance of "Chemtrails"
Fact: There is no such thing as a "Chemtrail". 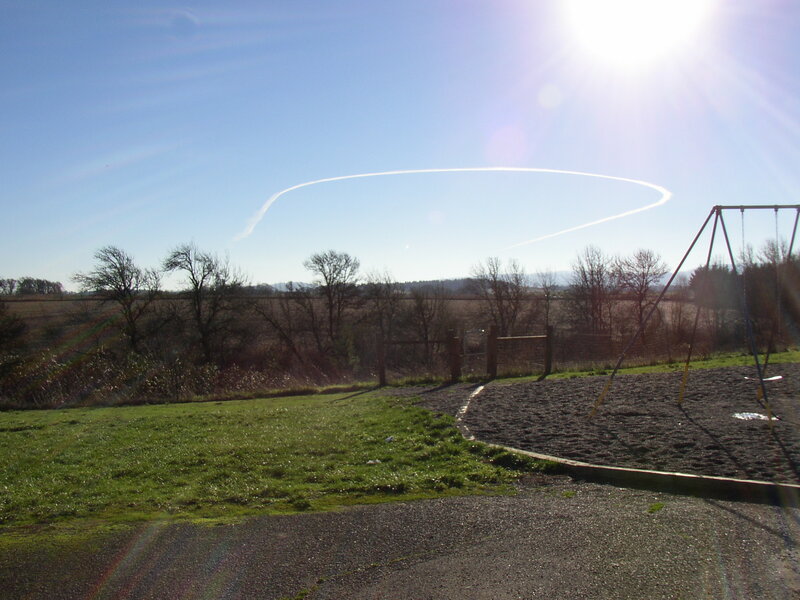 Contrails are safe and are a natural phenomenon. They pose no health hazard of any kind. If there are massive outbreaks of illnesses, your local health department should be able to tell you if it is an abnormal event. Local health departments generally network together when they start seeing problems. If there is a problem, the CDC will get involved. Claim: Samples taken have shown the presence of the "DOD patented" bacteria pseudomonas fluorescens. Fact: The bacteria claimed to be DOD developed and patented is actually a common, naturally occurring bacteria. The U.S. Patent Office (www.uspto.gov) lists 181 patents involving pseudomonas fluorescens, none of which are held by DOD.